Alderney Commercial Quay is a vital transport link to the Island with most freight arriving via the quay. This project involved the reconstruction of the quay revetment to a new design. • Keeping the public safe with adequate fencing and signage. • Leaflet drops to local businesses and residents to explain the project. • Consultation with the Harbour Authority for rock deliveries by sea and movement of materials by lorry. • Notices to mariners on shipment of the rock armour. We worked hard to minimise noise and visual disturbance to local residents and recreational users of the harbour. The protection of identified wildlife and their habitats, and new habitats found during the course of the works, was part of the environmental briefing put into action on this project. 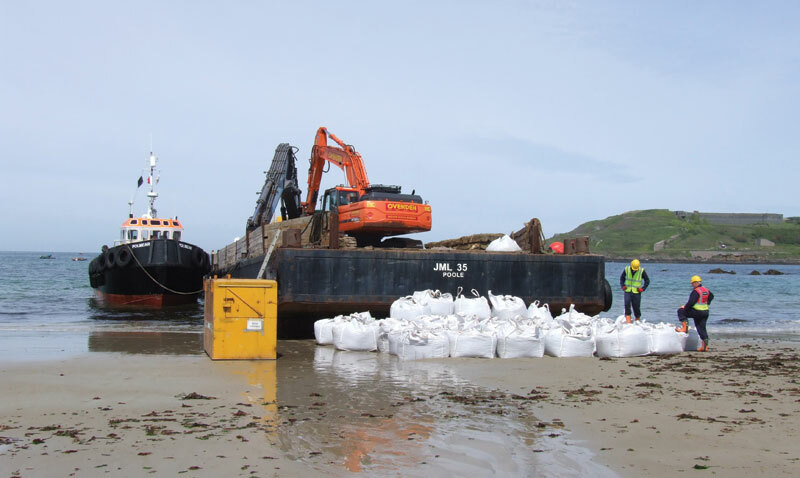 • 22,000 tonnes of Cornish Granite delivered to the beach by ship and then loaded onto local 10-tonne dumpers. • 3D modelling of the rock revetment was created to enable the finished revetment profile to be obtained using GPS. • The revetment was placed in tertiary, secondary and finally primary rock layers. • Breaking out of the existing concrete slabs and mass concrete wall for reuse and recycling. • Creation of a mass concrete foundation with layers of ‘T’ blocks. • On completion of the concrete works the final section of the new revetment was added.